HMG will plan, produce and implement a strategic, cost-effective advertising, direct marketing or digital marketing campaign to increase awareness of your company brand or product or service offering. We utilize the latest online technologies to promote and maximize exposure across the web and social media outlets and our detailed analytics will provide up-to-date reporting on impressions, engagement and inquiries. Online Advertising: We have more than 30 years of experience in creating and executing full-service marketing programs, including digital advertising platforms, pay-per-click campaigns, organic and paid search, and more. Email Marketing: Our staff is experienced in crafting effective email campaigns – from start to finish – with a focus on increasing engagement and conversions. We then measure the results for effectiveness in support of your original marketing goals. Social Media: We may manage your already-existing social media accounts, or provide information and guidance on which channels are most effective for your company’s budget and needs. 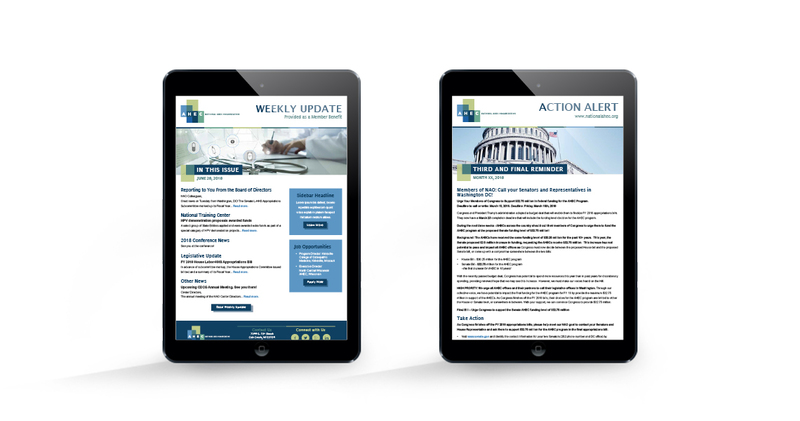 After the rebranding process, which HMG facilitated, we worked with the National AHEC Organization (NAO) to integrate their newly redesigned brand with their weekly newsletter. After the rebranding process, which HMG facilitated, we worked with WM Plastics to promote their newly redesigned brand across digital platforms. We integrated the new branding into a comprehensive advertising campaign that was used across multiple ads and channels. We researched keywords for target business areas to develop the content on their website and social media platforms to drive organic traffic as well as support a strong PPC campaign. A PPC campaign was launched with carefully-developed ads and scheduling to help increase volume and lead conversion. We partnered with the Wisconsin Wine Society to communicate the organization’s message through email marketing and event advertising to attract new members and encourage current members to re-join. Through our efforts, we were able to grow the organization 300% within the first year, and helped the society host a number of successful events.